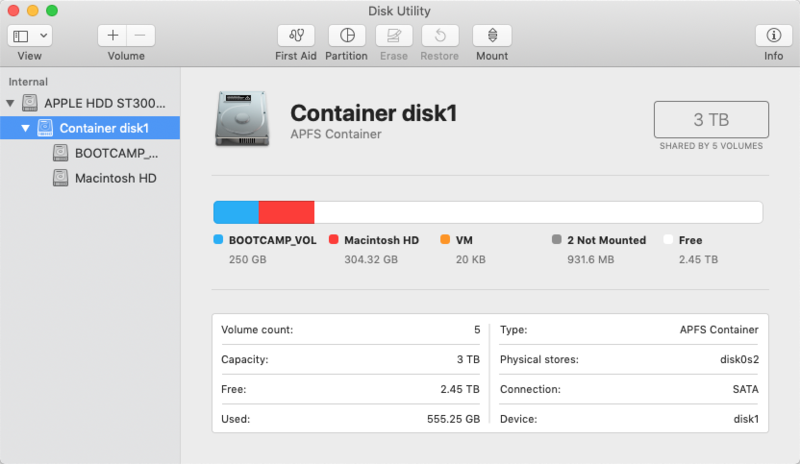 How to get back storage capacity from BOOTCAMP_VOL in Mojave without formatting? I have a hybrid drive version of iMac, and from the start I have bootcamp installed in my iMac but barely ever used it. The OS has upgraded many times and not it is on Mojave. I realized a while ago that bootcamp is no longer available on hybrid driver, but I didn't bother because I don't use it anyways. I am just curious now if I can reclaim the storage capacity from the BOOTCAMP_VOL (250GB in my case) without formatting the entire drive (the time cost is just too high, I don't feel that 250GB of storage capacity would worth the trouble). Open Bootcamp utility and hit the uninstall button. It’s in Applications/Utilities. Not the answer you're looking for? Browse other questions tagged hard-drive bootcamp imac . Why is a hard drive not readable anymore after removing it from the Mac? How to know the hard disk capacity for sure and how to recover lost partitions? Can I use the whole internal SSD for Boot Camp on a T2 based Mac (Mac mini late 2018)?